The Soviets are well-known for being the first to launch a satellite, a living thing, and a man into space. However, during and after the heady days of the space race, the USSR sought to upstage the US in space wherever possible. While the Soviets achieved many exciting firsts, they also experienced the first human tragedy in space. 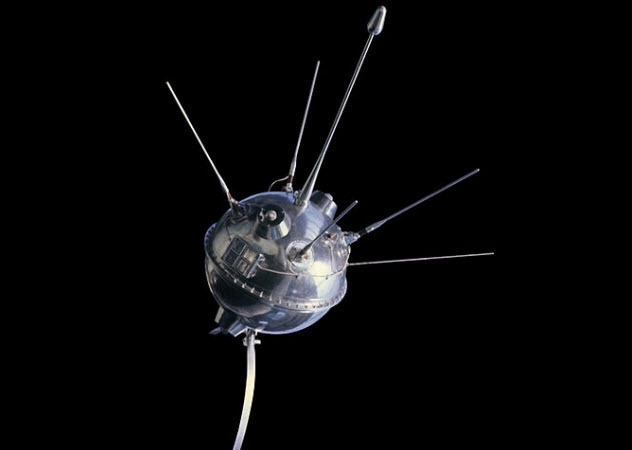 Launched on January 2, 1959, Luna 1 was the first spacecraft to successfully reach the vicinity of the Moon. The 360-kilogram (800 lb) spacecraft carried various metallic emblems, including the Soviet coat of arms, and was meant to crash-land on the Moon to demonstrate the superiority of Soviet science. However, the spacecraft missed the Moon, passing within 6,000 kilometers (3,700 mi) of the lunar surface. Releasing a trail of sodium gas, the probe was temporarily as bright as a sixth-magnitude star, allowing astronomers to track the probe’s progress. Luna 1 was at least the fifth attempt by the Soviets to crash-land on the Moon, with previous failed attempts kept so secret that even American intelligence was unaware of many of them. Compared to modern space probes, Luna 1 was extremely primitive. It lacked its own propulsion system, using only batteries to provide limited electric power, and didn’t have a camera. Transmissions from the probe ceased three days after launch. Launched on February 12, 1961, the Soviet space probe Venera 1 blasted off for a deliberate crash-landing on Venus. 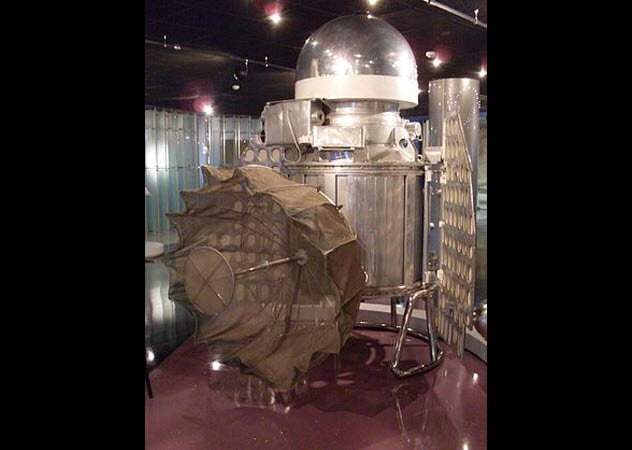 The second attempt by the Soviets to launch a probe to Venus, Venera 1 also carried Soviet medallions in a reentry capsule. Although the rest of the probe was expected to burn up on entry into the Venusian atmosphere, the Soviets hoped that the reentry capsule would impact on Venus, making them the first to deliver an object to the surface of another planet. The initial launch and communications with the probe went well, with three communication sessions with the probe indicating normal operation. But the fourth showed a failure in one of the probe’s systems, with communication delayed for five days. Contact was eventually lost when the probe was about 2 million kilometers from Earth. The spacecraft drifted through space, flying by Venus at a distance of 100,000 kilometers (62,000 mi), unable to receive data for the course corrections that would have caused it to crash on Venus. Launched on October 4, 1959, Luna 3 was the third spacecraft successfully launched to the Moon. 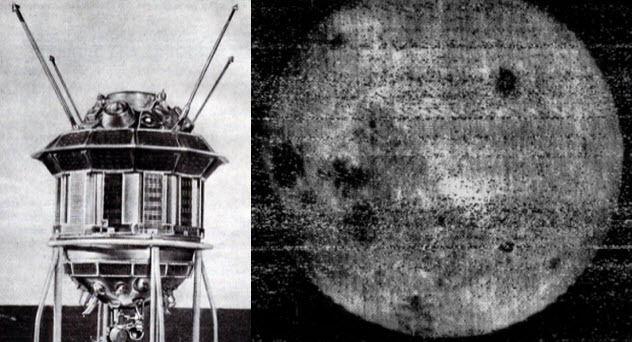 Unlike the previous two Luna probes, Luna 3 carried a camera to take pictures of the far side of the Moon, which had never been photographed at that time. The camera was primitive and complex. The spacecraft could take 40 photographs, which would have to be developed, fixed, and dried on the spacecraft. An onboard cathode-ray tube would then scan the developed images and transmit the data to Earth. The radio transmitter was so weak that the first attempts to transmit the images failed. As the probe moved closer to Earth, after having swung around the Moon, 17 resolvable photographs of poor quality were received. Still, scientists were excited by what they discovered on the images. Unlike the near side of the Moon, which was flat, the far side was mountainous and had fewer dark regions. On August 17, 1970, Venera 7, one of a set of twin Soviet spacecraft, lifted off and headed for Venus. The probe was supposed to deploy a lander to transmit data after it touched the surface of Venus, setting a record as the first successful landing on another planet. To survive in the Venusian atmosphere as long as possible, the lander was cooled to -8 degrees Celsius (18 °F). The Soviets also wanted to maximize the amount of time that the lander stayed cool. So they designed it to remain attached to the spacecraft body during entry into Venus’s atmosphere until atmospheric buffeting forced separation. Venera 7 entered the atmosphere as planned. However, the parachute designed to slow the lander ripped and failed, leaving the lander to fall for 29 minutes until it hit the ground. It was believed that the lander had failed upon impact, but later analysis of recorded radio signals revealed that the probe returned temperature readings from the surface for 23 minutes after landing, a testament to the engineers who built the spacecraft. The Mars 2 and Mars 3, twin spacecraft launched days apart in May 1971, were designed to orbit Mars and map the surface. In addition, both spacecraft carried landers. The Soviets hoped those landers would become the first man-made objects on the surface of Mars. However, the Americans narrowly beat the Soviets to achieving the first Mars orbit. Mariner 9, which also blasted off in May 1971, beat the two Soviet probes by two weeks and became the first spacecraft to orbit another planet. Upon arrival, both the American and Soviet probes found Mars covered in a planetwide dust storm, which interfered with gathering data. 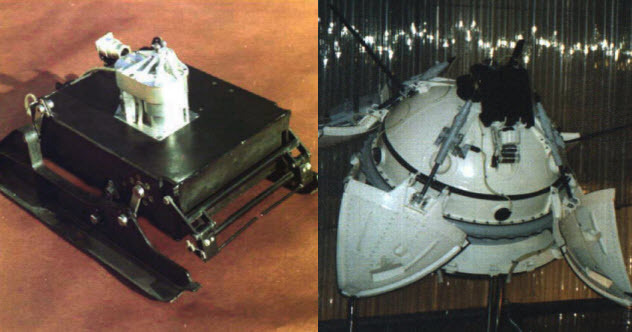 While the Mars 2 lander (pictured above, left) crashed, the Mars 3 lander (pictured above, right) successfully touched down and began to transmit. But the transmissions stopped after 20 seconds, and the only apparent photo showed no detail and low lighting. The failure was probably due to the massive dust storm on Mars, robbing the Soviets of the first clear pictures taken on the Martian surface. NASA had the Apollo astronauts collect Moon rocks to return to Earth. The Soviets, unable to land men on the Moon to do the same, were determined to upstage the Americans by using an automated space probe to collect and return lunar soil first. 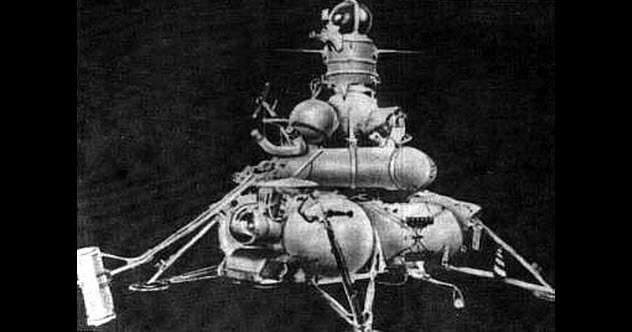 The first Soviet probe, Luna 15, crashed on the Moon. Their next five attempts crashed on Earth due to atrocious issues with the launch rocket. However, Luna 16, the sixth Soviet probe, was successfully launched after Apollo 11 and Apollo 12. Setting down in the Sea of Fertility, the Soviet probe deployed a drill to collect lunar soil and deposit it in an ascent stage, which blasted off and returned the soil to Earth. Prying the sealed container open, Soviet scientists recovered a mere 101 grams (4 oz) of lunar soil, compared to the 22 kilograms (50 lb) carried back by Apollo 11. The Soviet sample was analyzed intensively and found to have the cohesive qualities of damp sand. 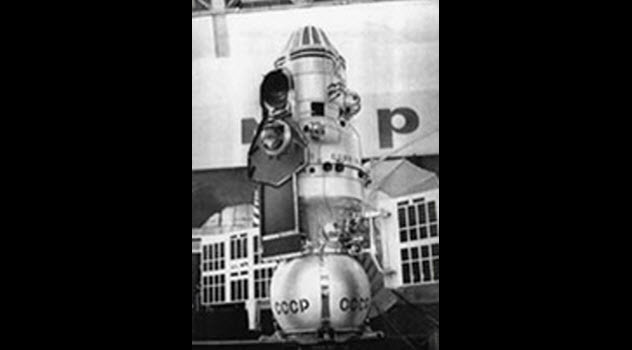 Launched on October 12, 1964, Voskhod 1 was the first spacecraft to carry more than one person into space. Although Voskhod was trumpeted by the Soviets as a new spacecraft, it was actually a slightly modified version of the same craft that had carried Yuri Gagarin into space. However, the mission sounded impressive to the Americans, who were not even flying two men in one spacecraft at that time. The Voskhod was considered unsafe by the Soviet designers. They continued to argue against using it until the government bribed them with an offer to send one designer as a cosmonaut on the mission. Still, the design of the spacecraft created a number of serious safety issues. First, the cosmonauts couldn’t make an emergency escape if the rocket failed because it wasn’t possible to build an escape hatch for each cosmonaut. Next, the cosmonauts were so cramped in the capsule that they couldn’t wear spacesuits. As a result, if the cabin depressurized, they would have died. Also, a new landing system, consisting of two parachutes and a retro-rocket, had only been tested once before the actual mission. Finally, the cosmonauts had to diet before the mission to ensure that the combined weight of the cosmonauts and the capsule was light enough to be launched by the rocket. Considering all the serious issues, it was surprising that the mission went flawlessly. On September 18, 1980, Soyuz 38 lifted off for the Salyut 6 space station. 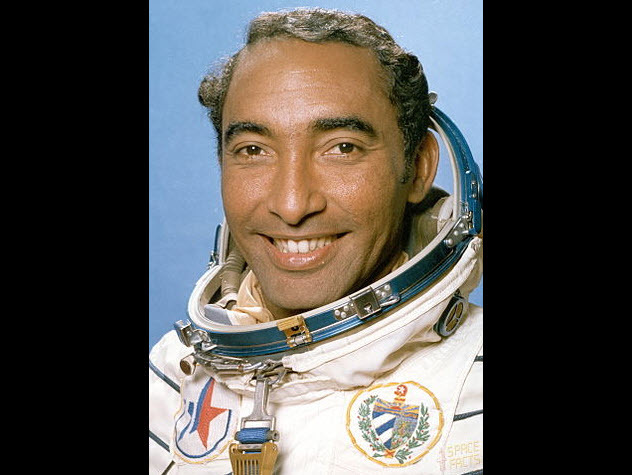 It carried a Soviet cosmonaut and Arnaldo Tamayo Mendez, a Cuban air force pilot who was the first person of African descent to go into space. His selection was part of a Soviet program called “Intercosmos,” which allowed other countries to participate in Soviet space missions. Mendez only stayed on board Salyut 6 for a week, but he undertook more than 24 experiments in chemistry and biology. He monitored his metabolism, the pattern of electrical activity in his brain, and how the bones in his feet changed shape in space. Upon his return to Earth, Mendez was awarded the title “Hero of the Soviet Union,” the highest decoration the USSR could give. As Mendez was not American, he was not the first African-American in space. That first belongs to Guion Stewart Bluford Jr., who flew on the space shuttle Challenger in 1983. On February 11, 1985, the Soviet space station Salyut 7 fell silent. A cascade of electrical shorts had swept through the station, knocking out its electrical systems and leaving Salyut 7 dead and freezing. In an attempt to save the station, the Soviets launched two veteran cosmonauts to repair Salyut 7. The automated docking system wasn’t working, so the cosmonauts had to get close enough to try a manual docking instead. Fortunately, the station was not tumbling, and the cosmonauts were able to dock, demonstrating for the first time that it was possible to dock with any object in space, even a dead and uncooperative one. The crew reported that the inside of the station was musty, icicles were growing on the walls, and the internal temperature was -10 degrees Celsius (14 °F). The work to restore the space station took place over a few days, with the crew having to check hundreds of cables to determine the source of the electrical fault. On June 30, 1971, the Soviet Union was eagerly awaiting the return of three cosmonauts from the world’s first space station after more than 23 days in orbit. But when the capsule landed, there was no response from the crew inside. Opening the hatch, ground crews found the three cosmonauts dead, with dark blue patches on their faces and blood running from their noses and ears. What had happened? According to investigators, the tragedy occurred immediately after separation of the orbital module from the descent module in preparation for reentry. A valve in the descent module had opened, and less than two minutes later, there was no air in the cabin. As the pressure dropped, the cosmonauts asphyxiated rapidly, unable to find and close the valve before they lost consciousness and died. Other fatalities have occurred during launch and reentry, but the Soyuz 11 accident occurred at an altitude of 168 kilometers (104 mi) when the cosmonauts were still in space, making them the first—and so far the only—three humans to die in space.